Gilfach Wen Barn is a recently converted stone building purpose designed to provide high quality accommodation for groups. The accommodation has been graded as 4 star by Visit Wales, and consists of a large drying room, dining room, kitchen, lounge, 4 shower rooms, 4 toilets, and 7 bedrooms. The building has underfloor heating throughout as well as an additional radiator in the drying room. The 37 foot by 17 foot lounge combines open space for workshops with comfortable space to gather in the evening. Groups are welcome to re-arrange the furniture to fit their needs. 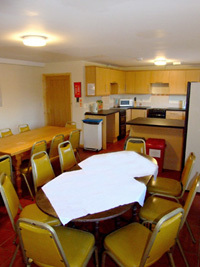 The large dining area can accommodate all of the group at meal times or be used as an area for practical activities. The fully equipped kitchen makes it easy to cater for the group, but is also spacious enough for self-service breakfasts if that is more appropriate. We do offer an optional catering service. Between them the 7 bedrooms contain 10 double and 12 single beds. 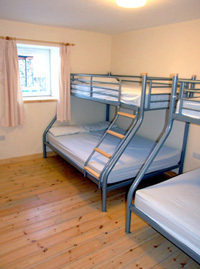 We use special bunkbeds designed for use by adults. Most of the bunkbeds consist of a double bed on the bottom and single above them. One of the bedrooms and shower rooms is downstairs and is fully equipped for use by disabled guests. Our accommodation complies with all the guidance and recommendations of HASPEV (Health and Safety of Pupils on Educational Visits: A Good Practice Guide). A virtual tour of the accommodation is available to assist group leaders in preparing their risk assessment. This is tour provides both floor plans and a video tour of the building which can be used to zoom in at features or view the layout of each room. We would be happy to provide you with a guided tour of the accommodation and discuss any special requirements by appointment.